Yeah I wasn't necessarily planning on starting to award points for them yet, but then Brother Steven and Eklund's were both so good, I figured we might as well open it up, especially since the first LC is over. I'll allow 1 MOC to count for FB (free-build) points this month, since there is only a week left, and then after that, you'll be able to do 2 per month for 2 points each. LC1 Winners posted in first comment of this thread. Winner gets 5 points, Honorable Mention gets 1 point. Updated scores are reflected on leaderboard. Congrats to the winner and thanks everyone for participating! Congratulations to Eklund and Brother Steven for winning the contest. Thank you AK_Brickster (and I assume Wobnam) for running the contest. Honorable Mention!?!!?!?!! WOOHOO!!!!!! Congratulaitons Eklund!!!! and thanks everybody!! can't wait untill the next one!! Thanks guys! And a special thanks to AK for running this and for the timely results. Loved those entries, they definately were worth the points! Hey guys, let's not let those Loreesi and Lenfels show us up! Our fearless leader, Jhirian Eindrik, would like you to put together your best representation of your Garheim forces and post a picture here. We need to show them our matchless military might! Doesn't matter if it's 5 figures or 50. Just make sure they look sharp! Keep in mind the guidelines for Garhim when assembling your forces. Our emphasis is on light infantry, since horses and heavy armor struggle in the deep snow. You can definitely have some cavalry if you want though, since we do have some regions that receive less snowfall than the far northern reaches. I prefer that my Garhim troops have a bit of scruff, since fair skin is easily frostbitten, but that's just my personal preference. They also don't all have to be part of the same battalion. For example, I have mine separated between Black Falcons, Crownies, and Others. You can post multiple pictures if you need to (within the CC TOS). I will try to post some pictures of my men this weekend. This will not be for points, but for pride! Keep in mind that the new month is upon us, so you can cash in up to two more free-builds for points this month (2 pts each). Since the first Global Challenge will be announced soon, I'm going to hold off on starting any new local challenges, but we'll definitely have at least one, more likely two, of those this month as well. Lastly, keep sending in pics of your Garhim troops! Brother Steven set the bar high with his forces, so let's see if you can top it! 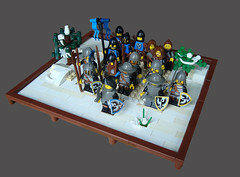 AK_Brickster wrote: Hey guys, let's not let those Loreesi and Lenfels show us up! Our fearless leader, Jhirian Eindrik, would like you to put together your best representation of your Garheim forces and post a picture here. We need to show them our matchless military might! Fellow citizens of Garheim - here is my small force of Garheim troops that has come down from the mountains. 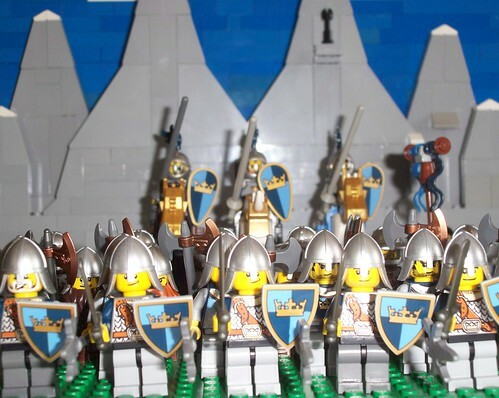 The front line has shield bearers armed with a sturdy broad sword. The second line has a line of men with halberds. The third line has dwarven troops with double-sided berdiche. The final line of infantry has the crack squad of crossbowmen. Bringing up the rear is the Captain of the Guard (Kroth Stonegrinder) and his two lieutenants and the squire carrying the Garheim standard. Nice job! I really like the mountain backdrop that you made for this. The statue on the side of the mountain is a nice touch. Hay! Great job! 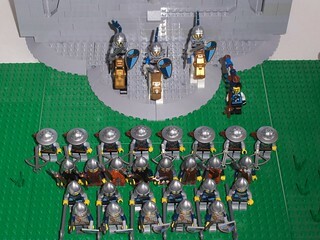 !, your formation looks very effective and the horsemen really Cool!! I was trying to give them a rough look, but now, some of the soldiers almost look like outlaws. Is the lack of blue a very big issue?